Iguazu Falls is a group of nearly 300 waterfalls, which are incredible in width and power. They are situated in the Argentinian National Park Iguazu, Brazil and the Iguasu Reserve. The powerful eponymous river waters have formed one of the most unique sceneries in the world at the boundary of the two South American countries. Indeed, the Iguazu Falls occupies an area of nearly 2.7 km of space along the river. Some of them have a height of up to 82 meters, but most are about 64-70 meters. The average amount of water from the river which flows down from the spectacular waterfalls, is about 1500 m3 per second and during different seasons ranges between 500 and 6500 m3 per second. 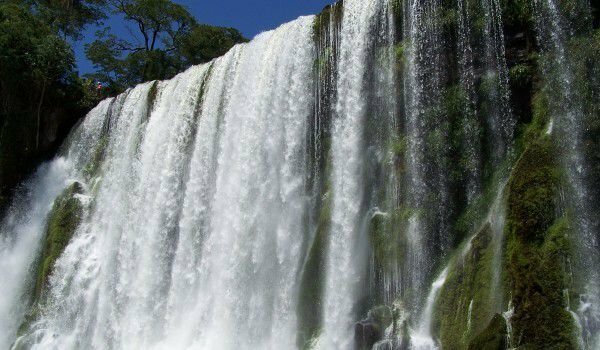 In the language of the Guarani tribe Iguazu means "great water". According to local legends the god fell in love with a beautiful girl and wanted to marry her. However, she fled along the river by canoe to her favorite mortal. The very angry God divided the rivers into two with the result that it emerged the waterfalls, dropping the girl into it. You can get to this beautiful natural phenomenon from Rio de Janeiro, arriving by plane at the airport in Fos which is near Iguazu and from there a daily aircraft from Buenos Aires that will take you to Puerto Iguazu. The area of the waterfall is associated with Paraguay's Ciudad del Este city, through the beautiful Bridge of Friendship. Garganta del Diablo or Devil Throat is the most impressive of all waterfalls in Iguazu with its 150m width and shape of the letter U. Right there is the border between Brazil and Argentina. 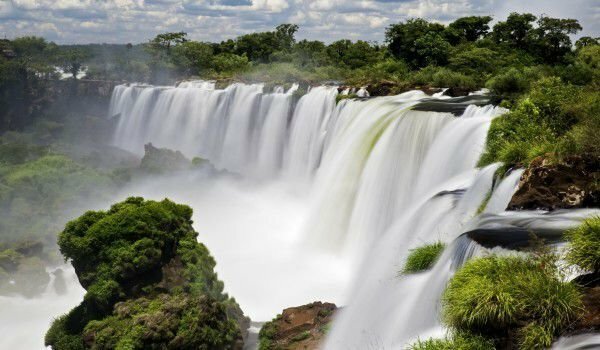 Most of the waterfalls are located in Argentina, although from the Brazilian side you do get a better view of the most impressive waterfall in the group. The first European who discovered Iguazu Falls, was the Spanish conquistador, Alvar Nunez Cabeza de Vaca. The water attractions from the Argentinean side of the river are named after him. The region has two national parks - one in Argentina and one in Brazil and part of the natural World Heritage sites are many rare and endangered plants, wild animals and birds. An interesting fact is that Iguazu Falls is also significantly higher than Niagara Falls.